Designer John Elliott worked in collaboration with Nike in October of last year, re-imagining it’s iconic Air Force 1 sneaker silhouette. The new iteration used a special layering construction method to give off an optical illusion that there is color on the all-white sneaker with the shadowing effect. 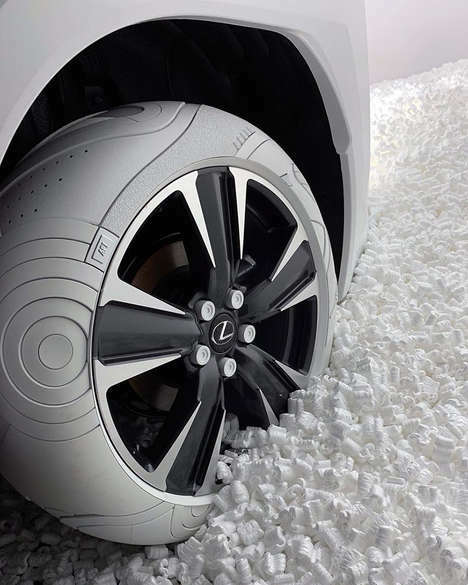 Now the designer works with Japanese carmaker Lexus, spotlighting the UX car model’s tires. The tires are inspired by Elliott’s collaborative work with Nike, creating them using the same technique and color. The collaborative tires are sleek and all-white, featuring textured materials and layering that is directly representative of the sneaker. Notably, the tires boast the signature Nike Swoosh and the classic Air Force 1 outsole design in the textural accents as well.